If you use the Mac operating system and suddenly the error 306 appears you follow the steps below to fix it. This error occurs in printers installed on computers that use the Mac system, our computer error appears 10.6.2 and 306 printer error. The causes of this error are a lack of communication between the printer and our equipment, we must first verify the connection of the printer must be properly connected to the computer and then try to print again. 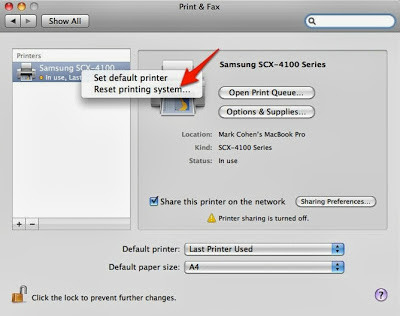 One possible solution is to go to printers and faxes Apple System Preferences. They appear all installed and ready to configure printers, select the printer that is presenting the problem and make a right click. Click the Apple symbol in the upper left of the screen. If the padlock on the bottom left is locked, enter your password and unlocks. Remove the printer by pressing the (-) and then add the printer again using the (+) button, leave this printer as the default again. In case of problems with the configuration, type a comment in our form below.